Guy Lawson; born in 1974, he has been playing the Double Bass since he was fourteen. Classically trained, including three and a half years studying repetoire at the Victorian College of the Arts; which he deferred from to travel the East Coast of the U.S.A., upon the invite of Disneyworld, with the Melbourne based Ukranian Cossak dance troupe; Hopak. As well as performing with the U.C.A., Melbourne University, and Geminiani orchestras, Guy has been involved in the Victorian rock scene since 1991. Specialisig in 1950/60's style double bass, playing with bands such as; The Axemen, Strictly Vinyl, Yeah Yeah, and currently; Wild Turkey. 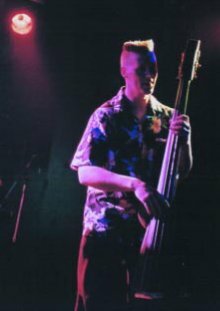 In between gigs, Guy is working on his own compositions for the Double Bass and various instrumental combinations, with the aim of producing his own C.D. He's also in the midst of writing a handbook on the Double Bass.